So Pod Mods are all the rage in vaping. We are also keenly aware that “best” is a preference based thing, so we bring you the five best for you to choose from. Personally I carry three of these around but then again these types of devices now account for 50% of all sales in vaping. So let’s get started figuring out which of these five is perfect for you. 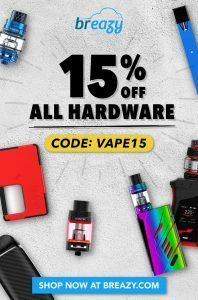 The JUUL by JUUL Vapor: The JUUL itself is an electronic e-cigarette device that is inescapable. Everywhere you go it can be found for sale. This is because it has become synonymous with the product category of pod mods. 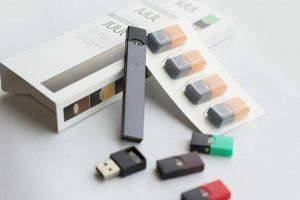 The draw to JUUL is that it is better known than most and offers an extremely simple introduction into vaping. People tend to refer smokers to JUUL simply because it’s what’s best known and some can argue it has proven to be quite effective in transitioning smokers into vaping. 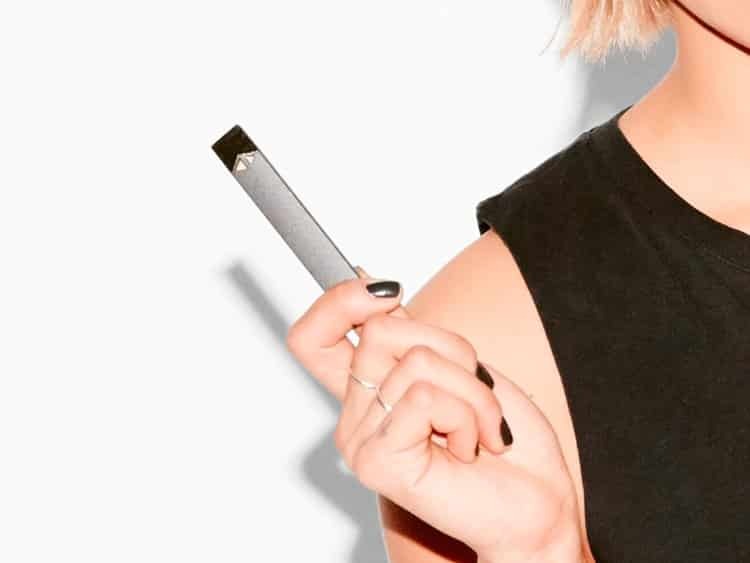 The thing that makes the JUUL such a compelling device is that you can’t really escape it. Part of the draw is the nicotine satisfaction, and though this satisfaction can only be achieve through their proprietary pods which come in packs of four and have an MSRP of $15.99 (with some exceptions: Some stores have been known mark up these pods as high as $25 for a four pack). There is something special about the nicotine used in these pods because vapers definitely swear by it and one of the major reasons this ranks as our top pod mod is because it is a device you could hand to an octogenarian and they would be capable of using it within minutes. Some of the cons with the JUUL is that you are not going to find the same experience in other pods, the salt/alkaloid nicotine comparison just isn’t close to many who use it. So once you experience you might find other types of pods to just not have that same oomph. Another con is the 0.7ml capacity of each pod, if you were a heavy smoker and picked up a JUUL you might find yourself going through pods at an alarming rate if you aren’t careful. There are third party pods for the JUUL but most just don’t live up to the original and again that thing that makes the JUUL pod special to you might not be there. Again, this is all subjective, there are vapers who happily refill their JUUL pods with salt nicotine liquids and don’t miss the original flavor or nicotine. The JUUL comes in different offerings. You can buy the basic kit with no included pods for $34.99. 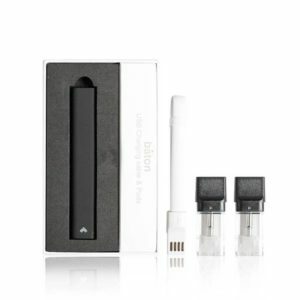 It also comes as a starter kit that offers the device as well as four pods in a variety flavors for $49.99. The pods can be found online for $15.99 per pack. Baton V2 Pod Mod by Baton Vapor: Baton Vapor really surprised us with the V2 of their device. While the original offering came up short on our meter the sequel is nothing short of splendid. One thing the Baton V2 Pod Mod uses that the JUUL doesn’t is the micro usb charging port it offers. It’s design is just a tad bit bigger than the JUUL but the pods and the airflow are totally different. The thing that Baton got correct was creating this device alongside the development of their own line of liquids. Why is this so good? They make their own salt nicotine in-house and it’s quite honestly the best outside of the formula JUUL concocted. The device provides much improved airflow, definitely better airflow than a JUUL. Each pod can be filled to 1ml capacity. One of the big positives in this device is that it features japanese cotton wicking which has become quite standard in vaping. It definitely has an impact on flavor and cloud production. The device itself features a 350mah which isn’t exactly world changing but its still more power than that of the JUUL. The kit includes two pods as well as charging cable alongside the device. The only con I can find with this device is the battery life, for a device a bit bigger than the famed JUUL it only gives us an extra 100mah of power. While that can be countered by its easy to charge just about anywhere design, someone at Baton Vapor pay attention..we want more battery life! 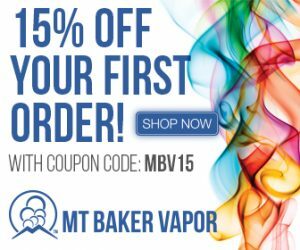 Try the glacier mint by Baton Vapor, it gives any menthol in the industry a run for it’s money. If you feel inclined to really use that second include pod mix up a bit of glacier mint with their fruit flavor for a really awesome pod mod experience. The Baton Vapor V2 Pod Mod comes in at $34.99, with replacement pods coming in at $9.99 for a 2 pack. 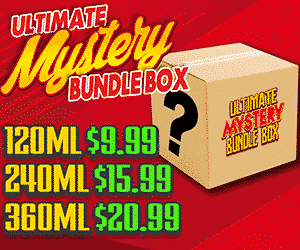 Each bottle of their liquid retails for $9.99 for a 10ml. 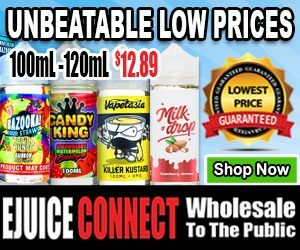 A bottle will last you at least 10 refills of your pods so in the long run it is cheaper than most of the top 5 products listed on this page. 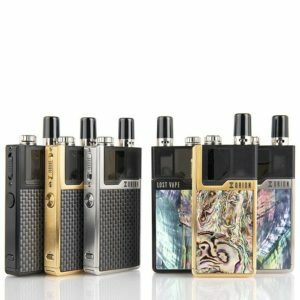 Suorin Air by Sourin: Sourin, the company that came out of nowhere and rocked the industry. 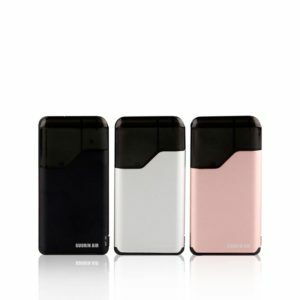 What stands out about the Suorin Air Pod Mod? It holds 2ml of liquid per pod, it looks like a thicker credit card, and looks like a very very very thin wallet when placed in the pocket. Sometimes success can be measured by convenience and that convenience can be something as small as the capacity of a pod. Unfortunately, the likelihood of enjoying the full 2ml capacity on one charge is very low due to a 400mah internally battery. Everything can’t be perfect folks. Sourin does get many things right from its airflow to its size, it feels meaty enough but sleek. The Suorin Air Pods are also great in quality and very rarely have we seen them leak (Really hot days or not properly using the cap to seal it are often the catalyst for leaking). The Suorin Air features an off switch which might just be ideal for some consumers. Among, larger sized harder to lose devices the Suorin Air shines because of its style and it’s approach to vaping. You will have to fill the pods yourself so that might be a con for you and the replacement pods are par for the course in terms of pricing but due to its age the entry cost is low and you’ll have fun finding the right liquids to enjoy with it. 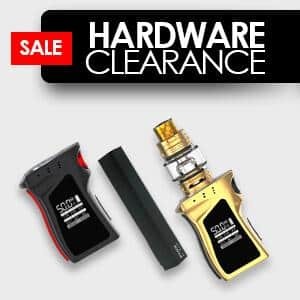 Orion DNA 40W Pod Kit by Lost Vape: Boy oh boy! The DNA chip in a pod device is alive and the experienced vaper who knows chipsets knows this thing has to be special. While some might argue that this is in the grey area of pod mod systems it still operates on pods, just with more power and more size. If you’ve read the rest of our suggestions on this page, you’ve noticed a patter which is cons being battery power. This bad boy packs 900mah of power which is estimated to power you through a whopping 450 puffs per charge. That means with the DNA chip inside you’ll get a perfect execution of power output and performance. Between the battery output, the power output, and it’s chipset this device starts off nicely, the 3ml capacity per pod is also a nod in its direction. Each pod offers the choice between a 0.5 ohm coil made of SSL316 with a concentration on flavor over clouds or a 0.25 ohm coil constructed with the same material but a focus on clouds over flavor. Options are good and not really offered by any of the other products on this page. In terms of pod mods this is the most powerful, the longest lasting on the go experience. Some of the cons are the size of the thing, its not as discrete although it does hide well in most hands but it’s considerably beefier than most pod mods. The pods aren’t as great as those of the Baton V2 in terms of flavor but it’s 3ml and the flavor is pretty good too. It does hands down with the cloud output race by a landslide because it does output more power to the coils. A huge nod to the design of the device overall, it’s quite beautiful and even though its resemblance might be close to that of a mini walkie talkie you’ll love it. The power output choices are low, medium, and high by simply clicking the bottom button on the devices front. At the time of publishing this article the price for the device is $64.99 and includes a pod with it’s initial packing. 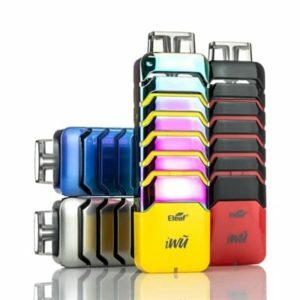 Eleaf IWU 15W Pod Mod Starter Kit: Eleaf surprised us because we simply thought this device was beautiful and easy to customize to your color of choice. With its 2ml capacity of storage for e-liquids this thing vapes exceptionally well. With a 15 watt output it’s not close to the Orion in terms of performance but its considerably more powerful than everything else in our top five. Unlike the other device this one can change its look rather simply by buying separate cages for the power system. It ranks somewhere in the middle off the pack in terms of flavor but in terms of durability its the clear cut winner. This device is almost impossible to break and the IWU is pretty darned hard to lose. The kit includes two pods which means you’ll be pretty set for about the first month of ownership and finding liquids for it as with other refillable devices is pretty simple.